For a few years now NASA’s Voyager 1 spacecraft has been flirting with the edge of our Solar System. After nearly 36 years and over 18 billion kilometres of travel, the space probe is now way past Neptune (4.7 billion km from Earth1) and even Pluto (7.4 billion km2). Next stop: interstellar space. 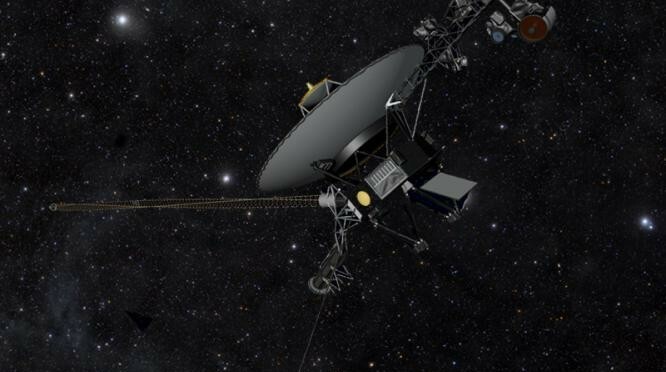 Yet it seems at this point nobody knows for sure whether Voyager 1 has already crossed that boundary. And we have a rather fuzzy notion of what that boundary even looks like. Our Solar System is located within the bounds of heliosphere, a region of space akin to a giant bubble, dominated by a magnetic field and charged particles emanating from our Sun. Solar wind, consisting mostly of protons and electrons, travels away from our star at over 1,000,000 km/h, and slows down once it hits interstellar medium, which is composed mostly of helium and hydrogen gas. Known as “termination shock,” this slowdown is the first sign of the edge of the bubble. What’s theorised beyond it is a heliosheath where the solar wind is turbulently interacting with the interstellar gas. This area is followed by heliopause – the theoretical boundary where solar wind stops. A University of Maryland-led team of researchers came out with a paper in The Astrophysical Journal Letters last week claiming that actually the famous space probe left the Sun’s sphere of influence on July 27, 2012. “It’s a somewhat controversial view, but we think Voyager has finally left the Solar System, and is truly beginning its travels through the Milky Way,” said lead author Marc Swisdak. It’s controversial because as recently as last year NASA still argued the opposite to be true. According to their scientists, while Voyager 1 has recorded successive dips in solar particle counts to the point when only galactic electrons and protons were detected, the direction of the magnetic field has remained the same. Hence we’re still in the bubble, albeit on the very outermost edge of it. “Here, magnetic reconnection produces a complex set of nested magnetic “islands,” self-contained loops which spontaneously arise in a magnetic field due to a fundamental instability. Interstellar plasma can penetrate into the heliosphere along reconnected field lines, and galactic cosmic rays and solar particles mix vigorously. “Their model would mean that the interstellar magnetic field direction is the same as that which originates from our sun. Bottom line? The scientists don’t know yet. And we don’t know, either. But I’ll be damned if it still isn’t an absolutely fascinating journey to keep track of.